Product #60750 | SKU MIOPS-MRP-C1 | 0.0 (no ratings yet) Thanks for your rating! 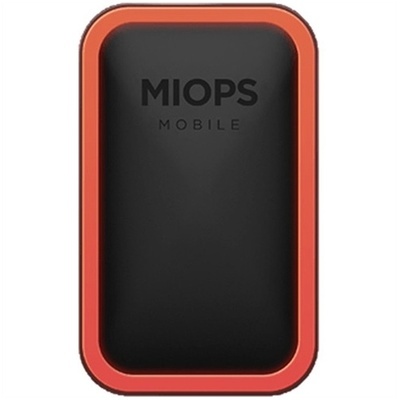 Miops MOBILE Remote Plus is a high-speed smart camera trigger which is controlled by smartphone application. It can be used for remote shooting, timelapse, HDR photography and lightning photography. It enables your DSLR and mirrorless cameras to capture high-speed photos triggered by sound, light or when any objects break the laser beam. This coiled camera connecting cable from Miops is made to connect a trigger to a Canon 3-pin camera. Release your camera shutter remotely from your smartphone. Six different release modes are available: Cable Release, Press&Hold, Press&Lock, Timed Release, Self Timer, Timed Release & Self Timer. Set the number of frames, interval and exposure values. Press the start button and hundreds of photos will be taken automatically. Combine these photos to create great time-lapse videos! Detect lightning strikes and trigger your shutter instantly, daylight or night! The new MIOPS RemotePlus features a dedicated sound sensor to capture the sound events with no delay. It is fast enough to capture high-speed events. Have you ever seen yourself while screaming? Trigger your camera when any item breaks the laser beam which aimed to the RemotePlus camera trigger. You can add some delay after detection and capture great scenes! Trigger your camera based on the distance you have travelled by using the GPS on your smartphone. Create time-lapse video of your journey! Vibration or shaking your smartphone will trigger your camera remotely! High Dynamic Range photography - Capture photos with auto-exposure bracketing. Merged them into a single, perfect HDR photo!